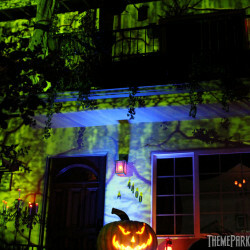 One of the most outrageously amazing home haunts Theme Park Adventure has ever seen is The House at Haunted Hill, located in a quiet neighborhood in Woodland Hills, California. 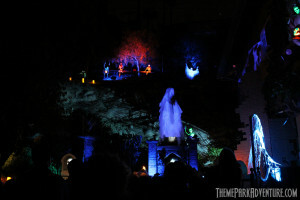 As Universal Studios Hollywood’s Halloween Horror Nights is the must-see large-scale haunt spectacle each year in Los Angeles, House at Haunted Hill is the must-see home haunt spectacle in the Greater LA Area every October. 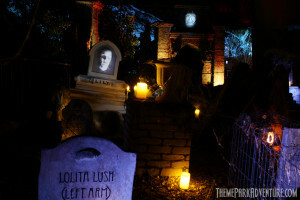 2013 marked the 13th year for the elaborate haunt, which draws thousands of wide-eyed visitors each season to the home at 4400 Saltillo Street. 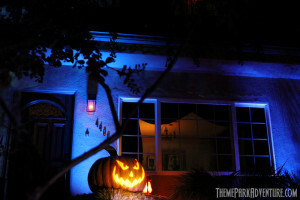 TPA sees a lot of haunts of all sizes and types; nothing comes close in high-tech wizardry and professional show quality to that of The House at Haunted Hill. 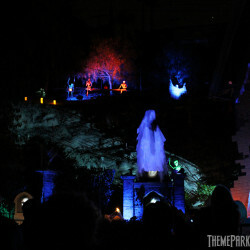 Regardless of how often we see the production, we always stand dumbfounded by how amazing it is on multiple levels. The tale told in this mind-blowing haunt is that of a once-beloved Hollywood starlet, Ms. Julietta Larue and what becomes of her when she becomes involved with actor Billy Valentine and his sinister secrets from a very dark past! We didn’t shoot any video this year, but TPAers can watch the 2011 version of The House at Haunted Hill that we did shoot, using the master mix of the soundtrack for the audio overlay. 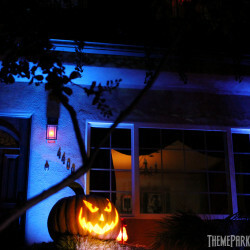 The professional appearance of The House at Haunted Hill can be attributed to its creator, Matt Ford. When he’s not up to his eyeballs in tombstones and spectral apparitions in his yard, he is the owner of Magic Lantern Creations, which specializes in professional lighting design for television network and cable productions. Using his everyday tricks of the trade and professional design skills, Matt delivers a world-class production each season right at his home to the delight of fans and neighbors, which is a huge plus for this haunt! Other favorite aspects of mine regarding HAHH include the masterful script, which was written by Ed Valentine, based on a concept that Matt’s wife, Lori Merkle Ford came up with. The show’s popular “fade in, fade out…” phrase is probably the best line I’ve ever come across for a haunt anywhere, and I was thrilled this year to hear fans actually reciting the line along with the narration, just as fans at Disneyland do in the Haunted Mansion’s elevator – “There’s always my way!” When your haunt reaches fan recital status, you have made it as a haunter! 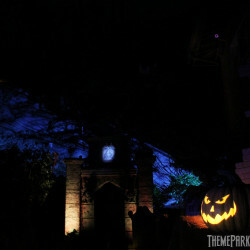 The epic soundtrack score for The House at Haunted Hill was created by Christopher Hoag, an Emmy-nominated composer who absolutely nailed it for Matt and his production. Very Danny Elfman-like in style, the House at Haunted Hill score is something I can listen to countless times (and have) without growing bored or tired; it is beautiful, and brilliantly captures the story and theme of the haunt. Ed Valentine wrote an awe-inspiring script for The House at Haunted Hill; Corey Burton lent his vocal talent to the production, bringing Jack Pumpkinhead to life. Fans of HAHH may not know that Burton is also the impeccable Paul Frees sound-alike that Disney uses for its Haunted Mansion Holiday overlay as the attraction’s disembodied Ghost Host. Many more talented individuals have helped Matt each season and every year, The House at Haunted Hill becomes just that much more better, utilizing state of the art registered projection effects, theme park quality show controls, and flawless Pepper’s Ghost effects. 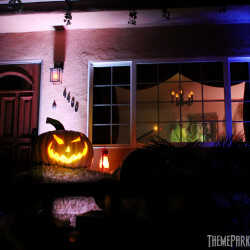 Since we “discovered” this show a few years ago, it’s been one of the haunts I personally look forward to seeing the most each season, because it really is what I loved the most about Halloween as a child – that one house on every couple of blocks that went all-out for the night with decorations and spooky effects; HAHH is that on steroids, and each time I stand there watching, I am 10 years old again, gaping in amazement. I love Matt, Lori, and his team for that! If you missed The House at Haunted Hill this year, there is always next Halloween; with this much advance warning, you have no excuse not to see it in 2014! 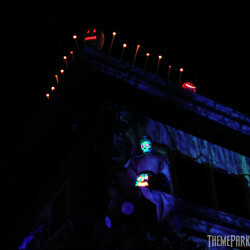 Until then, enjoy the few images we snapped this season, watch the 2011 video and start your Must See list for next year, with The House at Haunted Hill at the very top! For those fans of HAHH, be sure to check out TPA’s 2011 exclusive interview with Matt as well for a behind the scenes chat about this world-class production. Are you a fan of HAHH? If so, share your own thoughts below with other TPAers! It’s always fantastic to discuss this particular home haunt with others – our personal enthusiasm for it couldn’t be any stronger! 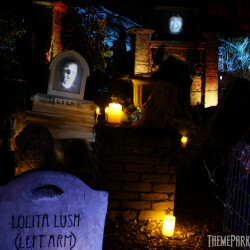 This entry was posted in Haunted Attractions, Home Page, Home Page Slider and tagged Christopher Hoag, Corey Burton, Ed Valentine, Hallowed Haunting Grounds, Halloween, Haunted House, Home Haunt, Lori Merkle Ford, Los Angeles, Matt Ford, Neil Patrick Harris, San Fernando Valley, The House at Haunted Hill, Theme Park Adventure, TPA, Woodland Hills, yard display. Bookmark the permalink.